This day has crept up, slowly, but steadily, all year. I've thought about it almost every day, and especially through all those stupidly cold and dark winter runs, and the boring treadmill tempos I did in the warehouse gym at work. At times I thought this day would never come. But come it has. 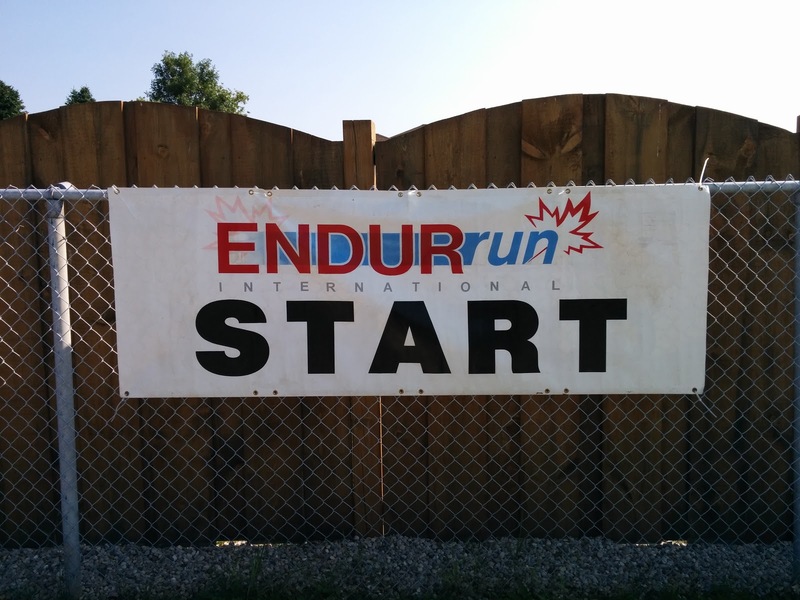 It's time, once again, for the ENDURrun. This year is the 6th time I've participated in the ENDURrun, and the 5th time doing the whole week, which is affectionately called "The Ultimate". Last year, due to family commitments, I could only do "The Sport" which is the last 3 days of "The Ultimate". I've participated more times in this race than any other. You can actually read all about the other times here (2009), here (2010), here (2011), and here (2012). Don't bother with 2013; it was bad. I think I was grinning the whole drive up to Waterloo. Pulling into Hotel Laurier, getting my key, going up to my suite, meeting my buds, going to Zehrs to shop for food, all of it like a homecoming. That's a total of 160km over the course of 8 days, and 7 stages. A lot of running. You probably think I'm crazy for even thinking about doing it once, never mind for the 5th time. 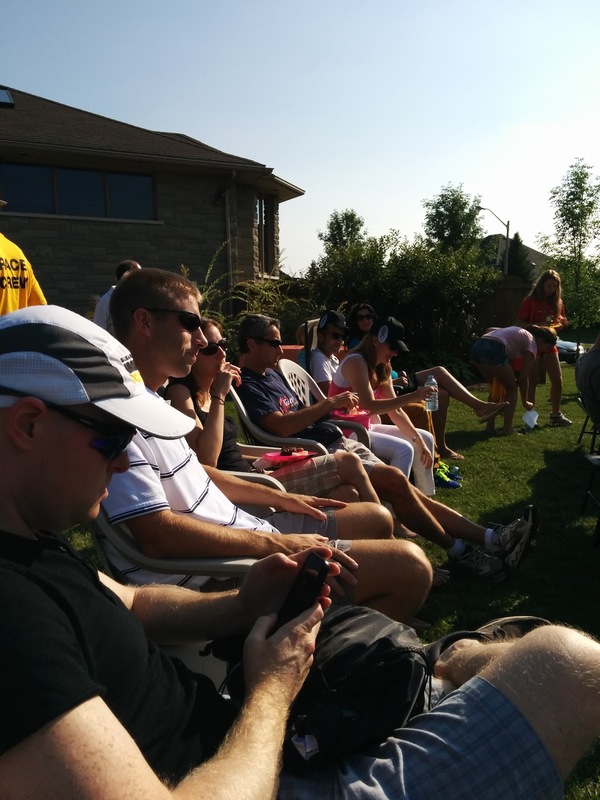 If you read my other blog entries, you'll quickly see why I love this race so much. If there's one thing that stands out above all else, if I had to describe this race in one word, it would be this: family. This is a event where once completed, you will be a lifetime member of a new family. You are treated like family from the second you pick up your race kit, to the second it's over 8 days later. You will have a whole whack of new Facebook, Twitter, and Instagram friends. From the fastest, to the slowest, they will be your new friends. They will motivate you and raise your own level of running and training. This will happen. Be ready for it. The start of great things. After a brief check-in at the Hotel Laurier (WLU Residence), we headed over to the race director's house for the pre-race meeting and kit pick-up. The meeting takes place in his backyard, which is large enough to accomodate all of us quite comfortably. An added bonus was the beautiful day; sunny and warm. Everyone listening intently to Lloyd. Except for Mark. This meeting is great because it's like a homecoming and reunion all in one. This year there are a lot of new faces, but also many returning runners, and it was awesome to see them and catch up with them again. Lloyd and his son Jordan outlined the things we needed to know for the race week ahead. We also were introduced to the core of the amazing volunteers that will be working. This year, it is an army of people, all there to make it so all we have to think about is running. After it was over, it was time to do some shopping for the week, relax, unpack, and get ready for tomorrow morning. I also got to go through my swag bag. This race doesn't disappoint when it comes to the swag. 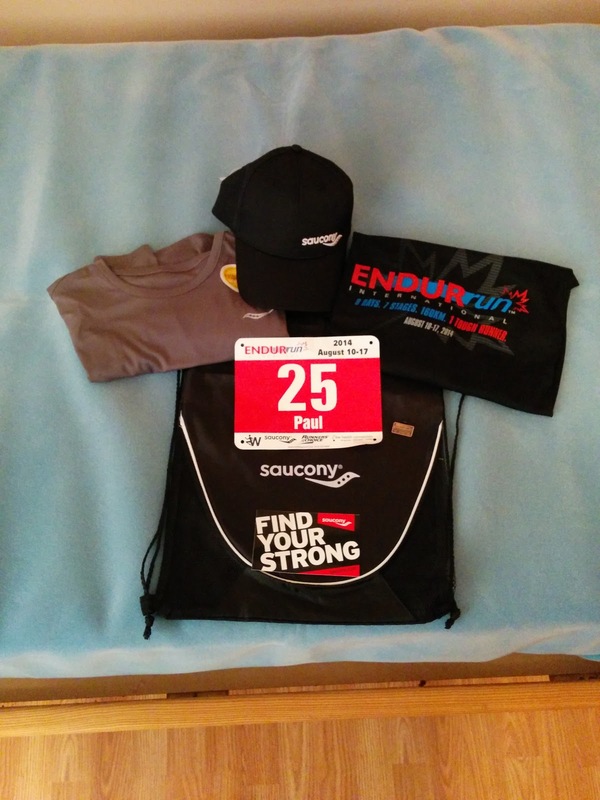 In addition to the race shirt, we also received a second technical shirt from Saucony, a hat, ENDURrun commemorative pin, Saucony sticker, water bottle, and bag. The rest of the evening was spent having a beer with my other roommates, and slowly getting things ready for tomorrow. It's an 8am race start, which means I need to be up at 5:30am or so, to have enough time for a shower and breakfast. As in years before, I'm going to be documenting each stage here on my blog. I'll also provide a link to Strava where you can find the course map, the official times as per my smart phone, and other data for the stats geek in you. Time to turn in now, dream fast thoughts, and hopefully be well rested for the half marathon.